Today I'm editing a stored procedure. I wanted to compare my current editor window to whatever the document manager may have saved.. but I can't find any revisions saved in document manager. I close and re-open SQL Editor and try again thinking it's a hiccup. Same result. If I hit Ctrl-0 after waiting 15 minutes after making a change, nothing shows up in any of the document manager filters. Usually "All Documents" show a document in bold (maybe current document tab?) but the "Current Document" and "Currently Opened" tabs are completely blank.. nothing. Then, if I decide to close SQL editor and get the save prompt and press CANCEL and immediately go back and hit ctrl-0, suddenly I have a bolded document in "All Documents" and they also show up in "Current Document" as well as "Currently Opened".. BUT I don't have the revision I started with prior to making my change (in this case, a comment to track if document manager is doing ok or not). Then if I remove the comment, hit Ctrl-0 and check "HEAD" against Revision 1 I can see my changes in revision 1 versus the 'head file'. But none of this happens unless I somehow invoke the "Save Documents" dialog. Shouldn't this be remembering changes I made in the editor tab throughout my coding session as well? Isn't that the point of the 15 minute backup interval is for? Your description of what you expect from the revisions is correct. But why it doesn't work as expected is unclear. Do you see multiple revisions saved for any recently modified files? How many files do you currently have in the History subfolder? I do see some files, mostly with 1 revision(mostly all called query1.sql or something like that.. whatever the default name is). . I see a few with more but they're actual scripts I've saved and revised versus stuff I write ad hoc and may only use for a day or two. I'll have to check how many files are in the history subfolder tomorrow morning. Could you also please check that %APPDATA%\SQL Assistant\9.2\saDocMng.xml file is not corrupted? Try to open it in a web browser. If that file is corrupted, your browser should show an error message. saDocMng.xml opens fine in chrome. History directory contains 230 items. Thank you. I'm afraid this goes beyond my knowledge. Let me try to get some help here. I wrote out a new query, commented in it that I created it at 8:09AM. 8:12 has come and gone and no autosave happened. Oddly, the saDocMng.xml does have an 8:09 timestamp on it, though but that may be about the time I launched SQL Editor this morning as well. I renamed saDocMng.xml and let it create a new one, still no document history being created. 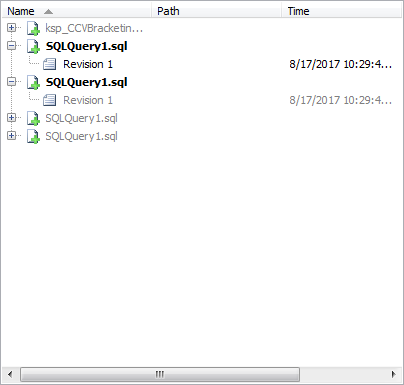 Relaunched SQL Editor after the saDocMgr.xml rename and now I am getting saves, but changes to my document are not getting revision stamps. *edit: now I have a Revision 2. Waiting to see if Revision 3 pops up after another change. *edit 2: It does appear to be doing better now. I'm up to 3 revisions. Perhaps the saDocMgr.xml was still corrupt in some way? You may need to restart not just the editor but all other development tools and the systray app too because this file is shared across all of them. Well in any case, it's acting much better. I opened the SPROC I was having problems with yesterday that prompted me to start this topic and it made an initial autosave pretty quickly. Going to see if I get a revision in a bit. Sure, I just sent it. I ran the XML through a parser app online and it didn't bark at me about malformed XML or anything, so I hope your team can identify the cause. Hrmm there's definitely something hinky in there. It eventually cleans itself up and removes one of the duplicates but I can't help but wonder if this is part of the problem? I hit this again. I can't say 100% for certain, but it had been working fine up until yesterday when I had SQL Editor open and I launched SSMS to check something else out.